Easy to moderate due to distance. Along with many larger properties with trail systems, the Barrington Land Conservation Trust has several small properties throughout town, most do not have trails. These two small properties adjacent to the East Bay Bike Path do have trails however. 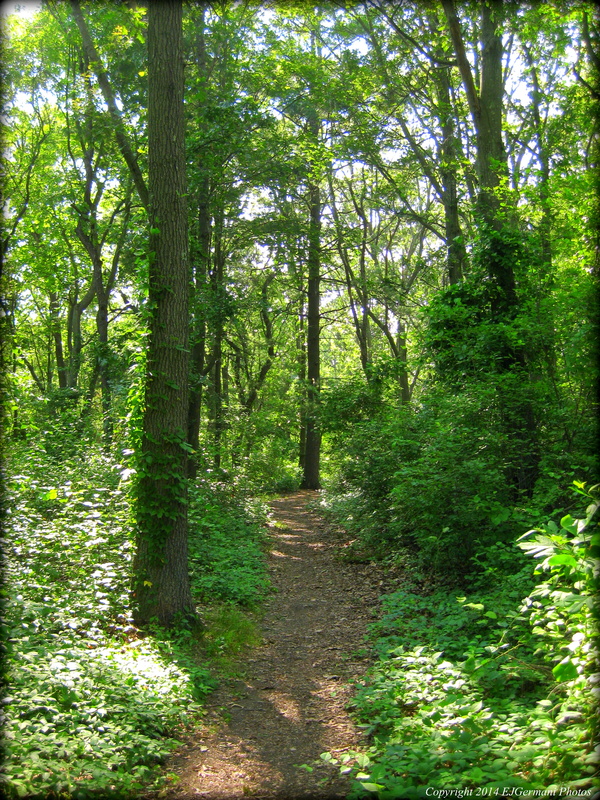 The Andreozzi Nature Preserve has a yellow blazed trail that runs from Leann Drive to the Bike Path and a spur trail that leads off the main trail. A little bit of a walk north along the Bike Path is the trail head to Lombardi Park that has a short trail that leads to Little Echo Lake. Along the trail is a granite bench. There are signs along the Bike Path for each of the properties. Jacobs Point is in the extreme southwestern corner of Warren and is only accessible via the East Bay Bike Path. The property abuts the Rhode Island Audubon’s McIntosh Wildlife Refuge. There is a single out and back trail that runs from the bike path to the Warren River through a salt marsh and to the beach and point. There is an abundance of bird activity here as well as plenty of wildflowers. Though short in distance, the trail offers plenty of picture opportunities whether it be of wildlife or an open marsh with sailboats in the distance. 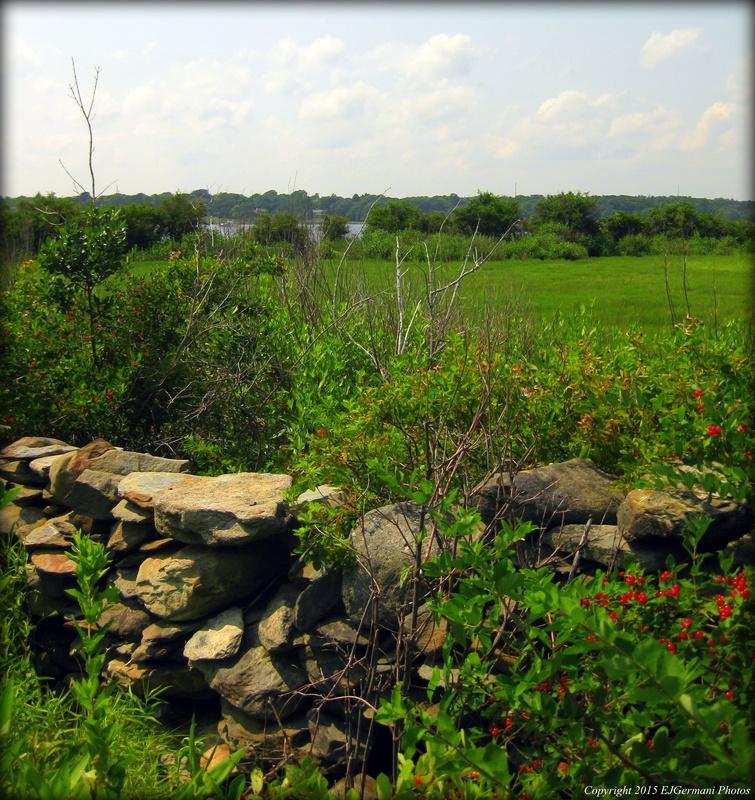 A Stone Wall At Jacobs Point. Bristol is most famously known for its Independence Day celebrations. The town is host to the longest running 4th of July parade in the United States which was first celebrated in 1785, a mere nine years after the colonies declared their independence from Great Britain. Patriotism runs deep in this town and in the weeks leading up to Independence Day it really shows. Bristol is situated on the east side of Narragansett Bay and its harbor has always played an integral part of the town. Downtown Bristol is home to several historical building dating back to the 1700’s as well as many “Mom and Pop” shops. Bristol is a thriving waterfront town and today’s walk covers both the waterfront and some of the towns historical district. Starting at Independence Park, at the southern terminus of the East Bay Bike Path, I first followed Thames Street in a southerly direction, then turned left onto Franklin Street making my way slightly uphill to Hope Street. Along the way I passed the first of, literally, a town full of shops. I then turned right onto Hope Street. This stretch is lined with several historic houses, lantern streetlights, and large old trees. Most of the houses have plaques on them citing the dates they were built. The first on the right bears a date of 1730 and ahead just before the bank is a massive ginkgo tree. You will also notice the red, white, and blue line in the middle of the street. The line is painted throughout the town along the parade route. In the weeks leading up to Independence Day this stretch is overtaken with flags and banners. Just before Bradford Street on the left is the Andrew School. It is the first of several school buildings along the route of the walk. The Colt School is next on the left just after Bradford Street. Built in the early 1900’s by a prominent Bristol resident, it was donated to the town as a school. Also on the left is Linden Place, a large mansion built in 1810. On the right is the Rogers Free Library housed in a building built in 1877. Just before turning left onto State Street, I came to the Bradford-Diman-Norris House. Built in 1792, it replaced a structure that was burned by the British during the American Revolution. Following State Street, I passed several more houses that were built in the early 1800’s. I then crossed High Street, passing the Walley School on the right. Continuing east I made my way to Wood Street opposite St. Mary’s Church. Along the way on the right is the Bristol Common. On the left I would pass the Bristol Train of Artillery and another old school building which is currently home to the towns School Department. At Wood Street I then turned right and started to follow the path into the Common that leads to the Gazebo. I continued pass the gazebo toward the back of the brick building at the corner of High Street and Church Street. This building is the Byfield School. The school is now used by several artists and their studios including the aptly named Liberty Looks studio. Note, while walking through the common, the row of buildings along High Street. They are the back of the Walley School, the First Baptist Church, the former Bristol County Courthouse, and the Byfield School. I then crossed High Street heading west along Church Street. A fire station is to the left at the corner and the rest of the street is lined with more historical houses. About mid way down the street on the right is a chapel that is set back behind a house. Just before the intersection of Hope Street on the right is the St. Michaels Garden. Across the street is St. Michaels Church, built in 1861, it is the fourth church on this site. The first was also burned by the British during the American Revolution. Turning right onto Hope Street, I then came to a large stone building on the right. This is the Burnside Hall built in 1883. It was used as the Town Hall until 1969 and today it is a visitors center. You can stop in and get all the information you need from its friendly staff. I then continued along Hope Street, passing the Belvedere Hotel on the left, and then turned left onto State Street heading back to the waterfront. 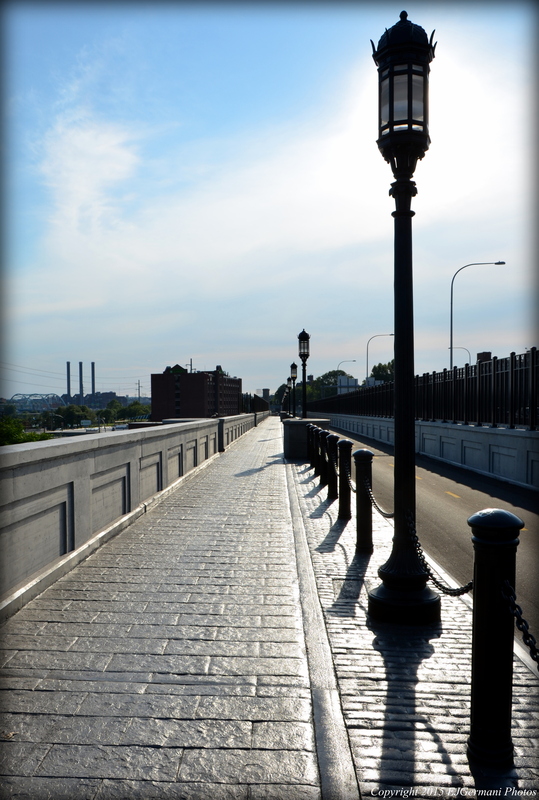 Crossing Thames Street, I followed the brick walkway to a restaurant along the water. 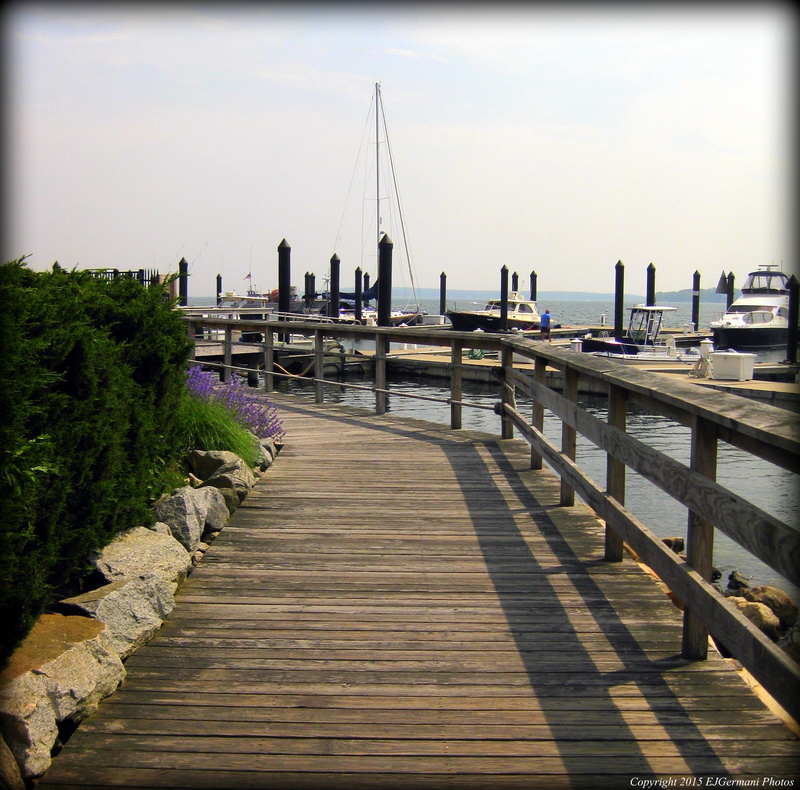 Just to the north of the restaurant is the beginning of the public boardwalk that follows the edge of the harbor. The boardwalk passes a marina, a condominium building and a couple of restaurants before ending at Independence Park. From here I crossed the park back to parking area, stopping briefly at a plaque explaining Bristol’s role in the American Revolution. You could easily add more mileage to this walk by zigzagging the towns blocks. Just about every street in this area has a structure of historical significance. This walk just scratches the surface of the towns history. Trail map can be found at: Bristol Waterfront. 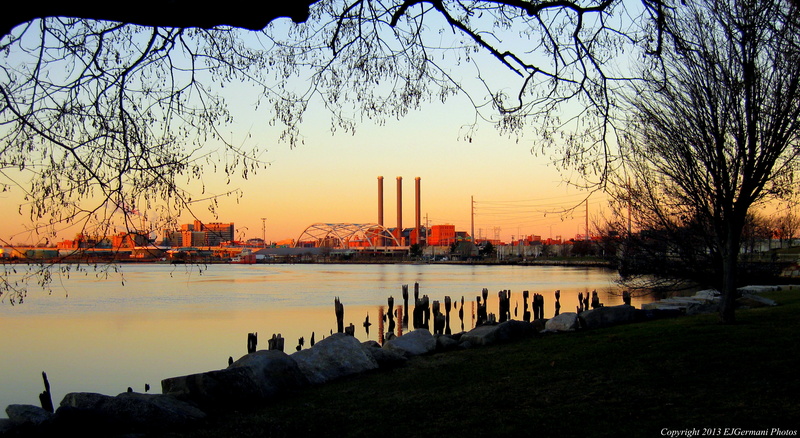 Haines Park is one of the oldest State Parks in Rhode Island opening in 1911. At one time prior to the 1938 hurricane there was a pedestrian bridge crossing the cove to Crescent Park (which in the day was one of the largest amusement parks on the east coast). It is mostly known for today for its waterfront access to Bullocks Cove, picnic areas, farmers market, and its ball fields. Essentially its a quiet little community park with the East Bay Bike Path running through it. Today, a 90 degree day here in New England, I decided to hike the short but rather tranquil trails that lie to the east of the bike path and wrap around the ball fields and dog park. I started from a parking area on Narragansett Avenue just east of the bike path. The un-blazed trail leads into the woods for a bit before the first “major” intersection. I opted to go to the right staying parallel to the bike path. Many side trails veered off to the right to the bike path and many to the left toward the ball fields. After a bit I came to another intersection. I opted to take the lower path which turned east and then eventually north. This trail had a couple paths that led to some obvious wetlands. The trail eventually ended at an opening at the road. There was a trail to the left that I followed back as it ran parallel and above the trail I was previously on. This trail eventually led back to the main trail I came in on. I briefly explored a trail that led to the dog park. A very aware beagle made my presence known as I approached the gate. From here I retraced my steps back to the car. I came across several birds, squirrels, and chipmunks on this hike. I also noticed that the wild berries are in bloom.